Patriots - Jaguars Key Matchups, Who Has the Razor’s Edge? - Patriots - Jaguars Key Matchups, Who Has the Razor’s Edge? Patriots – Jaguars Key Matchups, Who Has the Razor’s Edge? The New England Patriots head out on the road for their first road tilt of the 2018 season by taking on the Jacksonville Jaguars. The two teams met in the AFC Championship Game and now will meet again in Week 2. This week’s game will be broadcast by CBS on, at 4:35 p.m. ET and can be seen on WBZ-TV Channel 4. Jim Nantz will handle play-by-play duties with Tony Romo as the color analyst. Tracy Wolfson will work from the sidelines... The game will also be aired on the Patriots flagship radio station 98.5 The Sports Hub with Bob Socci and Scott Zolak on the call, produced by Marc Capello. 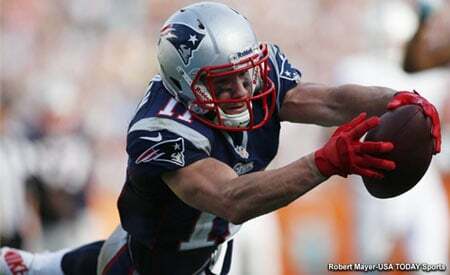 The Patriots (1-0) took care of business at home and defeated the Houston Texans 27-21 on Sunday in Foxboro. Tom Brady threw for three touchdowns and Rob Gronkowski had 123 yards receiving and a score. The Jaguars (1-0) beat the New York Giants 20-15 on Sunday. Blake Bortles completed 18-33 passes for 176 yards and a touchdown in the road win. The Patriots and Jaguars are meeting for just the 13th time overall in their history. New England holds an 11-1 overall record including last season’s AFC Championship Game win over the Jags. The only game Jacksonville has won was a Divisional Playoff game in 1999. The teams met in the preseason a year ago and conducted joint practices together so they are familiar with one another. The Patriots running game mixed things up with Rex Burkhead, Jeremy Hill, James White and WR Cordarrelle Patterson last week and gained 122 yards against a good Texans front seven. But Hill is out, done for the season with a torn ACL and his big physical presence will be missed. In typical overreaction Monday after Week 1, many were saying the Jags run defense was suspect after they gave up 137 yards to the Giants and rookie Saquon Barkley on Sunday. Caveat Emptor. The Jaguars front seven is just as solid if not more than Houston’s. With Malik Jackson and Marcel Dareus inside and Calais Campbell and Yannick Ngakoue on the edges, there are no holes or weaknesses here. Look for New England to mix things up with Burkhead, White, and Patterson again. The status of Sony Michel this week is still up in the air, he’d be a big positive for the team if he is able to suit up this week. Although I wouldn’t bet on it yet. The team signed Kenjon Barner this week. While he does have experience at returning punts, it is a bit of surprise since he is the approximate size of the other backs at 5’9, 190 and not the prototypical “big” back. The Patriots passing game was just fine against the Texans on Sunday, but although their front seven is outstanding, their secondary continues to struggle. Tom Brady spread the ball around to eight different wide receivers, but the big targets were Rob Gronkowski, James White, Rex Burkhead, and Phillip Dorsett. The Jaguars have that excellent front seven but they also have an outstanding secondary as well. A.J. Boyue and Jalen Ramsey are arguably the best pair of corners in the NFL right now. They can bring pressure and cover. As we saw last year, they can give elite QBs (Brady, Roethlisberger) fits. Look for the Patriots to use their RBs as slot receivers again, moving them around and splitting them out wide. Ditto for Gronkowski. The team could use a healthy Michel and Jacob Hollister in the passing game this week. Brady and Josh McDaniels will have to get creative at manufacturing some opportunities this week. But we’ve seen Brady do this for 19 years and he’s up to the task. Patterson may have to be a bigger part of the offense this week and could be the Patriots’ “X-Factor” this week in the passing game. The Jaguars had the top-rated running game in the league a year ago, a two-headed attack with Leonard Fournette and T.J. Yeldon. They are a dynamic tandem that helped average 141 yards per game on the ground. Fournette’s status is in doubt right now (Wednesday) because of a hamstring issue he tweaked against the Giants. If he can’t go, it is a big blow to the Jaguars running game. The Patriots run defense was bad a year ago and they brought in the players to fix it. Danny Shelton is the big, two-gapping run stuffer they need. He and Lawrence Guy inside were solid a week ago. But the combination of Malcom Brown and Adam Butler struggled and the team allowed 167 yards on the ground. While some of it was scheme related, they played a short box and had two deep safeties for much of the second half, the run defense needs to be much, much better. Look for the Jaguars to run inside this week, regardless of Fournette’s status. This is a problem area for New England who needs better interior play and for the linebackers to step up some more this week. This could be a big problem area for NE this week. But look for them to put a lot more emphasis on stopping the run. The Jaguars passing game lost a lot of talent (sound familiar?) this offseason. Allen Robinson and Allen Hurns left via free agency and Marquise Lee went on IR with an injury in preseason. Keelan Cole led the team in receiving yards last year and is now the go-to guy. Dede Westbrook and Donte Moncrief round out the WRs with Austin Seferian-Jenkins at tight end. Bortles is the “X-Factor” this year. He was thought to be the difference between Jacksonville being a very solid team and a Super Bowl contender. But the team believes in him and gave him a three-year $54 million dollar extension in the spring. The Patriots secondary with Stephon Gilmore, Eric Rowe, Jonathan Jones with Pat Chung and Devin McCourty is more than capable enough of shutting this group down enough to pull out a win, provided that the front seven keeps the mobile Bortles in the pocket. The Patriots did a very good job of bringing pressure and containing Deshaun Watson in the pocket. They need another similar effort. Look for the Jaguars to use play action to hit some big chunk plays down the field once they get the running game going. The Patriot will try to force Bortles into obvious passing situations and bring pressure and maybe force a turnover or two. The Patriots’ Special Teams is normally outstanding at kick coverage and last week, they were gashed a bit and allowed a 31-yard average. Look for a much stronger effort in that realm this week. But no such questions arise from the kicking game with both punter Ryan Allen and Kicker Stephen Gostkowski, both logging in very solid performances. Look for Cordarrelle Patterson to maybe influence the game a bit this week in the return game. The Jags counter with kicker Josh Lambo and punter Logan Cooke. Lambo took over at midseason in 2017 and solidified things in the kicking game but the Pats get the edge here with the experience factor. Well after the close game at home in the AFC Championship Game where Brady led the Patriots to overcome a 10-point 4th quarter deficit when the schedule was released, many immediately chalked this up as a loss. Everyone circled it and we heard universally, “this one is a loss.” This plays perfectly into Tom Brady’s hands. You can set your clock on and bet the house that the team has seen all those prognostications as well. Brady loves when people doubt him. It is the extra dose of motivation that many times gets them over the hump. The one thing we’ve all should have learned by now is not to count this team and especially this quarterback out. 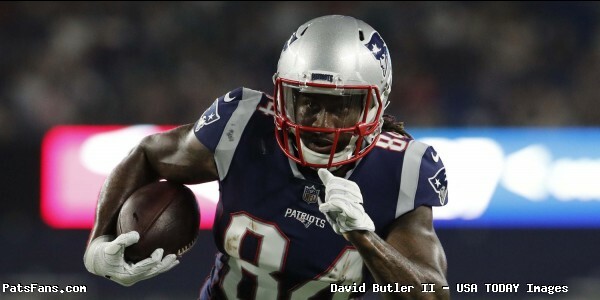 This entry was posted in 2018 Patriots Regular Season, NFL Commentary, NFL News, Patriots Commentary, Patriots News and tagged 2018 Patriots season, Bill Belichick, Blake Bortles, Chris Hogan, Cordarrelle Patterson, Donte Moncrief, Doug Marrone, Jacksonville Jaguars, Jalen Ramsey, James White, Leonard Fournette, New England Patriots, NFL, Patriots, Patriots edge rushers, Phillip Dorsett, Rex Burkhead, Rob Gronkowski, Stephon Gilmore, Tom Brady, Trey Flowers on September 13, 2018 by Steve Balestrieri.